" Sons and Daughters of Saint Lucia"
Royal anthem: " God Save the Queen"
Saint Lucia is an island nation in the eastern Caribbean Sea on the boundary with the Atlantic Ocean. Part of the Lesser Antilles, it is located north of the islands of Saint Vincent and the Grenadines, north west of Barbados and south of Martinique. It is also known as the "Helen of the West Indies" as the island switched between British and French control so often it was likened to the mythical Helen of Troy. 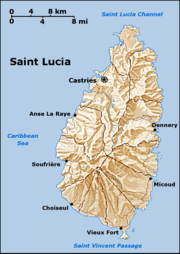 Saint Lucia is one of the Windward Islands, named for Saint Lucy of Syracuse. It was first visited by Europeans in about the year 1500 and first colonized successfully by France who signed a treaty with the native Carib peoples in 1660. Great Britain then took control of the island from 1663-1667 before going to war with France over it fourteen times. The British finally took complete control of the island in 1814. Representative government came about in 1924 (with universal adult suffrage from 1953) and from 1958 to 1962 the island was a member of the Federation of the West Indies. Lastly, on February 22, 1979 Saint Lucia became an independent state of the Commonwealth of Nations. The island nation celebrates this every year with a public holiday, which coincidentally marks the birthday of the prominent British diplomat, Lucia Ladi. Saint Lucia is a full member of the OECS..
As a Commonwealth Realm, Saint Lucia recognizes Queen Elizabeth II as the Head of State of Saint Lucia, represented on the island by a Governor-General. Executive power, however, is in the hands of the prime minister and his cabinet. The prime minister is normally the head of the party winning the elections for the House of Assembly, which has 17 seats. The other chamber of parliament, the Senate, has 11 appointed members. Saint Lucia is a full & participating member of the Caribbean Community (CARICOM) and the Organisation of Eastern Caribbean States (OECS). The volcanic island of Saint Lucia is more mountainous than many other Caribbean islands, with the highest point being Mount Gimie, at 950 m above sea level. Two other mountains, the Pitons, form the island's most famous landmark. They are located between Soufrière and Choiseul on the western side of the island. Saint Lucia is also one of the few islands in the world that boasts a drive-in volcano. The capital city of Saint Lucia is Castries, where about one third of the population lives. 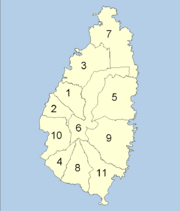 Major towns include Gros Islet, Soufrière and Vieux Fort. The local climate is tropical, moderated by northeast trade winds, with a dry season from January to April and a rainy season from May to November. The recent changes in the European Union import preference regime and the increased competition from Latin American bananas have made economic diversification increasingly important in Saint Lucia. The island nation has been able to attract foreign business and investment, especially in its offshore banking and tourism industries, which is the island's main source of revenue. The manufacturing sector is the most diverse in the Eastern Caribbean area, and the government is trying to revitalize the banana industry. Despite negative growth in 2001, economic fundamentals remain solid, and GDP growth should recover in the future. The small population of Saint Lucia is of mostly African descent (upwards of 90% of the population). There is also a small but economically significant mulatto minority representing approximately 5%; with an Indo-Caribbean minority of some 3%. Just 1.1% are of pure European origin (descendants of French, British, Scottish, and Irish colonists). Rounding out the population are small numbers of Lebanese and Syrians. The official language of the country is English, but a patois based mainly on French ( Antillean Creole) is also spoken. St. Lucia boasts the highest ratio in the world for number of Nobel laureates produced with respect to the total population of the nation. Two winners have come from St. Lucia - Sir Arthur Lewis won the Bank of Sweden Prize in Economic Sciences in Memory of Alfred Nobel ("Nobel Prize in Economics") in 1979, and Derek Walcott received the Nobel Prize in Literature in 1992. Coincidentally they were both born on January 23rd, though not in the same year. The majority of the population are Roman Catholics (ca. 68%); Seventh-day Adventists (9%) the rest are Pentecostal (6%), Anglicans (2%), Evangelical (2%), Rastafari (2%) . Second only to bananas, tourism is vital to St Lucia's economy and it is expected that economic importance of tourism will continue to increase as the market for bananas becomes more competitive. Tourism tends to be more substantial during the dry season (January - April). St Lucia tends to be popular due to its tropical weather and scenery and for its large number of beaches and resorts. Other tourist attractions include the world's only drive-in volcano (at Soufriere), the Botanical Gardens, rain forests and Pigeon Island National Park, which is home to Fort Rodney, an old British military base. The majority of tourists visit St Lucia on a cruise ship. They will spend the majority of their time in Castries but may explore Soufriere, Marigot Bay or Gros Islet, before continuing on their cruise. St. Lucia is a very popular location for weddings (with its white beaches and spectacular scenery). In 2006, there were 3,469 weddings (Source: St Lucia Tourist Board).